Currently in development for PC, PS4 and Xbox One, Drifters is the first full independently developed and published title from Blind Squirrel (who previously helped co-develop The Sims 4, Prey, XCOM 2, and Mafia III). The game takes place in a lighthearted Sci-Fi setting where space pirates fight each other while on missions, but all meet up at a bar which acts a as neutral zone afterwards where they get along with each other (a little like the Hotel in John Wick). Matches in Drifters take place between two teams of five, with each team fighting each other as they try to scavenge as much loot as possible from the location before it gets destroyed. The characters fulfil different roles in the team (tank, sniper, scout, etc.) and each one has a very unique set of skills. The loot you earn during matches will be divided among the players at the end, which can then be used to customize your character and upgrade your tech tree. 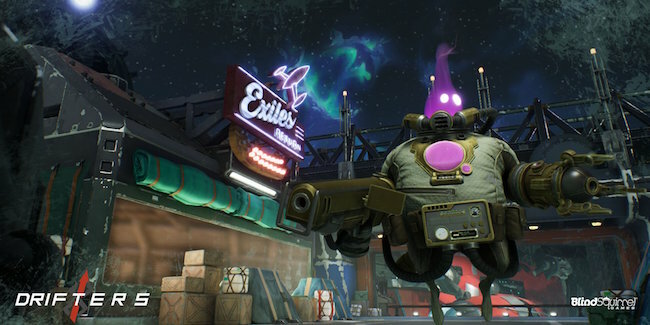 The characters in Drifters also promise to be a little different from what you’d expect from a normal shooter – such a one that’s a sentient cloud of gas that inhabits a spacesuit (and hence headshots have no effect on it). A lot of the weapons and characters have yet to be announced, but a major factor in Drifters is the grappling hook – a handy piece of kit that will allow players to propel themselves through the air, access hard to reach areas, bring items to them and even pull players towards them (like Scorpion in Mortal Kombat). It’s still early in development and there’s no gameplay footage available yet, but Drifters certainly sounds like a very enticing project. A multiplayer sci-fi hero shooter with a focus on fast paced arcadey gameplay, interesting characters and fun grappling hook mechanics. Sign up to be one of the first to plunder that space booty!